VANCOUVER, BC, July 28, 2015 — Mirasol Resources Ltd. (TSX-V: MRZ, Frankfurt: M8R) Mirasol Resources is pleased to provide an exploration update on its Gorbea Belt projects where the Company has recently announced a joint venture (see news release March 26, 2015). The mild winter conditions have led Mirasol’s JV partner to complete a 65 line-km, deep-penetrating IP geophysical survey over a portion of the Atlas high-sulphidation epithermal gold-silver system. Preliminary analysis of the IP data highlights large resistivity anomalies coincident with known gold-silver prospects, and outlines new anomalies that represent new exploration targets. The capacity of the Gorbea exploration camp has been doubled ahead of the planned southern hemisphere spring / summer aggressive exploration program. The Gorbea exploration camp is now secured for the winter months, with a planned restart during September – October 2015. The new IP survey completed by the JV partner covers approximately 24 sq. km of the Atlas gold system (Figure 1), and is comprised of 3 to 7 km long, 400 m spaced lines with dipoles on 150 m spacing. The configuration of this IP survey effectively maps a large part of the Atlas mineral system and penetrates to depths exceeding 400 m, deeper than previous Mirasol IP, providing a system scale overview for drill hole targeting. This geophysical survey will be further extended and infilled over key target areas in the springtime (September-October 2015). The expanded survey is planned to cover mineralization previously identified by Mirasol (see news releases December 10, July 18 and 23, and February 26, 2014), including the northern extension of the Atlas Gold Zone, the Escondida high grade silver target area, and the southern flanks of the Dos Hermanas (syn and post mineral) flow domes which may conceal additional exploration targets. Final processing and interpretation of this new data by the JV partner is in progress. Review of preliminary processed data by Mirasol in cross section and plan reveals a set of large geophysical anomalies which are in a number of cases spatially coincident with priority prospects defined by Mirasol, and in other cases outline new potential targets. This includes resistivity anomalies (+1000 ohm/m) over 2 km in length which extend the Oculto and Pampa Zone targets. Resistivity anomalies in high-sulphidation epithermal systems elsewhere in the Miocene-aged mineral belt of Chile have indicated the presence of hydrothermal silica that can be associated with precious metal mineralization. Large chargeable features were also noted to underlie the main prospect areas in the Atlas IP survey, suggesting that sulphide bearing mineralization may be present at depth. 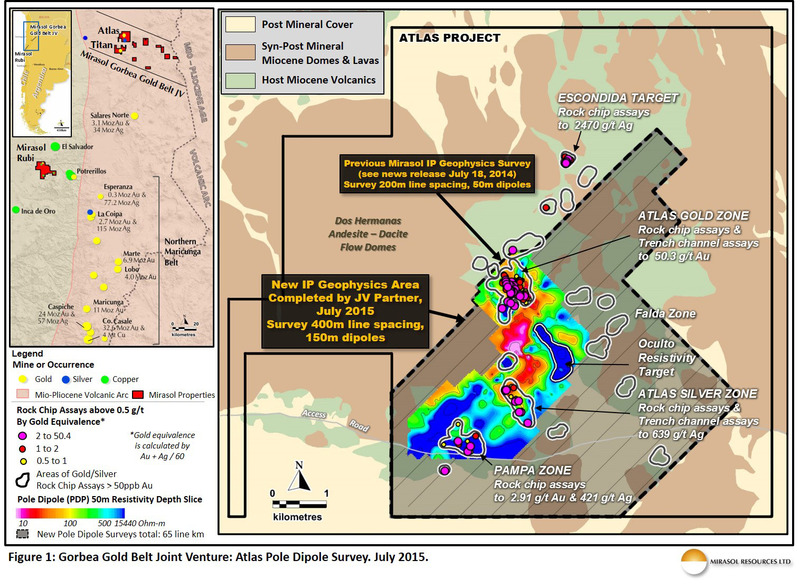 The IP survey data can also be used to estimate the potential depth of oxidation at Atlas that in some areas is interpreted to be in excess of 150 to 200 m. This relatively deep oxidation profile is an encouraging characteristic, suggesting the potential for discovery of oxide gold mineralization which may be amenable to cost-effective bulk-minable dump-leach methods. Over the July to September winter months the recent geophysical data will be integrated with Mirasol’s previous exploration data by the JV partner to plan the 2015 spring and summer exploration program. This program will include drilling at Atlas and Titan, as prescribed under the terms of the Gorbea JV, which requires a minimum combined total of 3,000 m drilling at the Atlas and Titan projects by the 1st year anniversary of the JV (May 9, 2016). Mirasol’s management is pleased with the progress and the results to date from the Gorbea JV; further updates will be made as key exploration milestones are reached on the nine Mirasol projects included in the JV. The JV Partner operates the Gorbea Joint Venture and generated the geophysical and information reported to Mirasol Resources. Industry accepted procedures have been used for the collection and analysis of this information. Mirasol has performed an independent analysis of the information provided. Stephen Nano has reviewed the data and prepared this news release, and is a qualified person as defined by National Instrument 43-101. Mirasol’s previous exploration at the Project was supervised by Stephen C. Nano, President and CEO, who is the Qualified Person under NI 43-101; and Leandro Echavarria, Mirasol’s Principal Geologist. All technical information for the Atlas project was obtained and reported under a formal quality assurance and quality control (QA/QC) program. Rock chip and trench channel samples were collected under the supervision of Company geologists in accordance with standard industry practice. Samples were dispatched via commercial transport to an ISO 9001:2000-accredited laboratory in Chile for analysis. Results of this exploration program have been audited by an independent geochemist to confirm the Company’s QA/QC process/procedures and laboratory performance met required standards. Assay results from drill samples may be higher, lower or similar to results obtained from surface samples due to surficial oxidation and enrichment processes or due to natural geological grade variations in the primary mineralization.